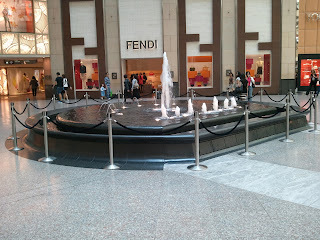 Passing through the Landmark the other day, after purchasing a pair of Thomas Pink boxers (it's the personal fitting that I like), I noticed that the fountain has been cordoned off. For decades, the public has been able to park their bums on the marble edge while waiting for their loved, or at least tolerated, ones. But no more. Could this be intended, I wonder, to stop our Mainland friends and their delightful offspring from performing gross acts in the fountain? Surely not.